We are delving back into the archives to revisit this really fun project we worked on for designer Hasan Hejazi in 2012. We were asked to create baroque inspired tonal cut work for three bespoke luxury evening dresses for pop goddess Marina from Marina and the diamonds. 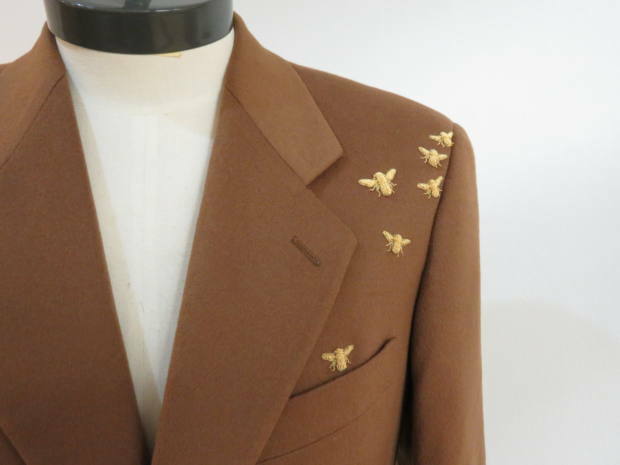 The project included some exciting names including Tim Bret Day (Photography), Thomas Knights (Film) and a suit for the designer by London tailor Gresham Blake. 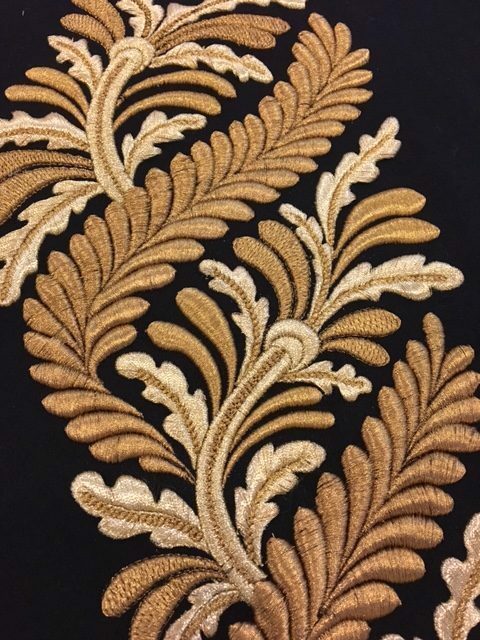 Our designs and drawings were based on victorian florid ornament something that is very good to translate to cut work. 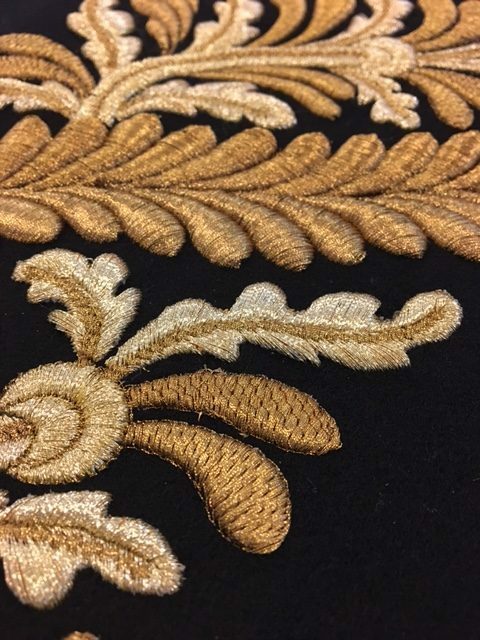 The initial designs and refining took a long time and the annotations and notes for the embroiderers even longer as there was so much detail involved. The embroideries were executed in cutwork in colours to match the dresses with a fade to either lighter or darker. There were also a few crystals scattered about to add a bit of light. The dresses were then put together over four days ready for the photo shoot. Before the event we hadn’t seen any of the dresses, so we were very excited for the launch. The first we saw was the full length red piece which marina wore for her performance at the beginning of the night. She then changed into the blue knee length dress which is our personal favourite ! The final pink dress was saved solely for the photo shoot, which you can see in the photos below. It was lovely to get a chance to flex our cutwork drafting muscles this thoroughly, so we are very grateful to Hasan for getting us involved ! A wonderful project all round. 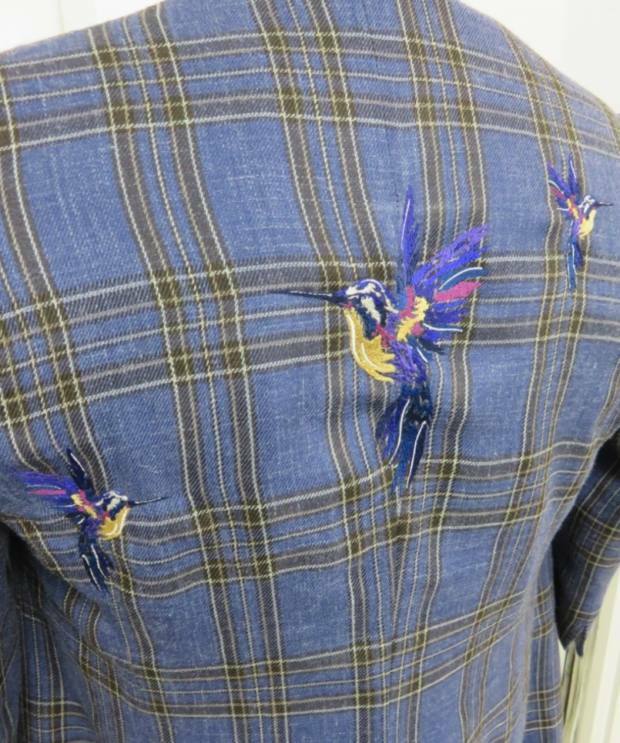 Last month, The Worshipful Company of Broderers held a fashion show, dedicated to the best of embroidery in British Fashion. Hawthorne & Heaney was invited to be involved and naturally, it was an opportunity that could not be missed. 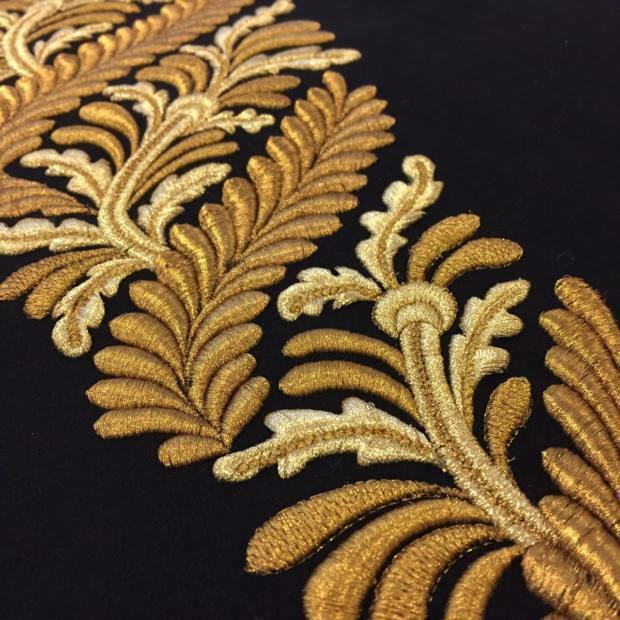 The Worshipful Company of Broderers is a livery company, dedicated to the protection and promotion of the art of embroidery. Also known as ‘The Brotherhood of The Holy Ghost of the City of London’, it was originally formed in the middle ages, receiving a Grant of Arms in 1558 and its first Charter on 25th October 1561 from Queen Elizabeth I. Charitable works lie at the core of the company as it functions today, with the fashion show acting as a fundraising event for their charity; Fine Cell Work and the Broderers’ Charity Trust. 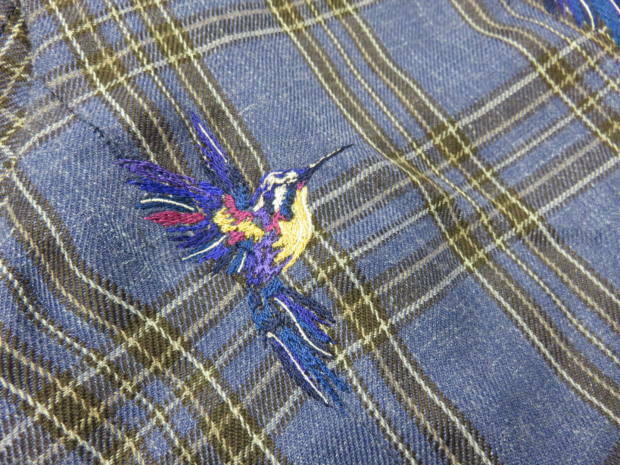 Fine Cell Work teaches needle-work to prison inmates and sells their products. Established in 1997, Fine Cell Work now operates in more than 15 prisons to empower and rehabilitate inmates in preparation for their sucessful return to society. 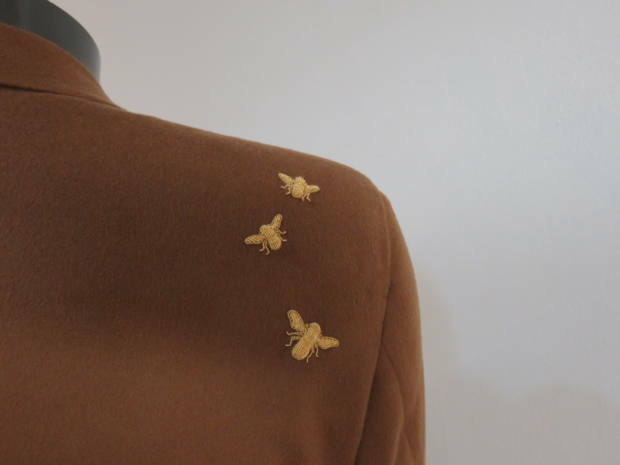 On what was a very balmy September evening, the company gathered beautiful examples of british embroidery work from well known designers such as Bruce Oldfield, Clements Ribeiro, Jasper Conran and Beulah, one example of which can be seen above. The show was held in the crypt of St Paul’s Cathedral, London with the ladieswear mostly demonstrated beadwork with an array of evening gowns on show (as seen above). 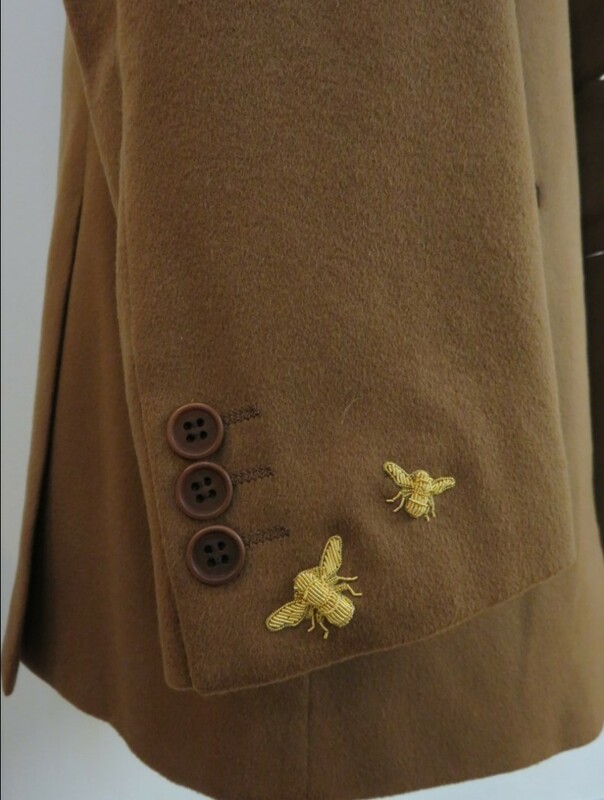 Hawthorne & Heaney was invited to contribute to the show in the form of these goldwork waistcoats for the gentlemen to wear. These were later auctioned off to raise further funds for the cause. The first features a circular dove motif on purple with silkworks for the center and a cutwork edge. The second piece was this striking pair of rampant lions on red. The lions are most embroidered over raisings with cutwork, a pearle purl edges and silver/red accents throughout. For more information on any The Worshipful Company of Broderers or Fine Cell Work, follow the links in the text above. 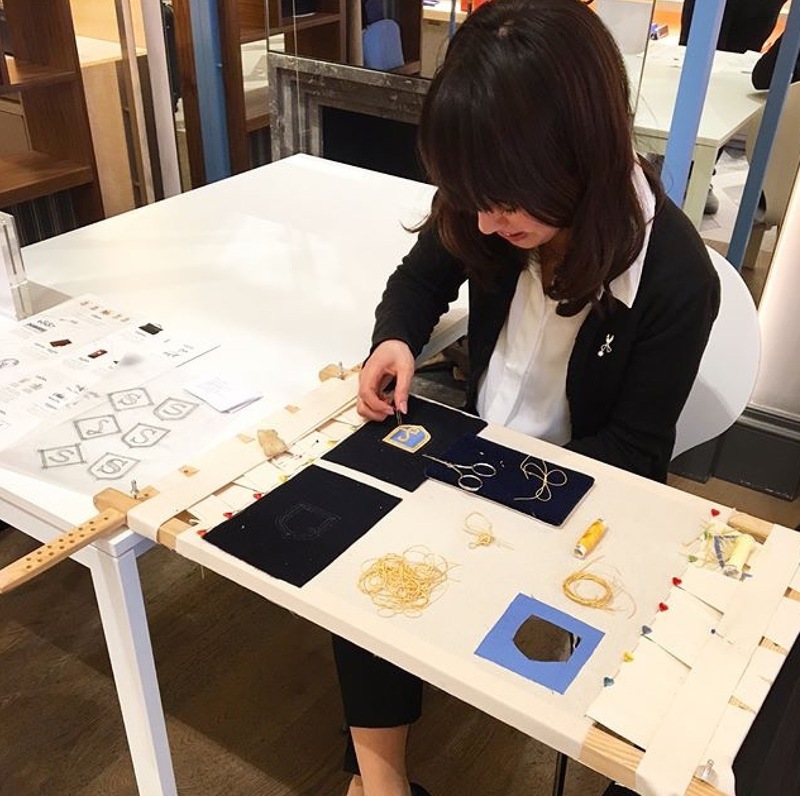 In addition to our own classes and exhibiting work at Anderson and Sheppard, we also were demonstrating goldwork at Smythson’s LCW event. 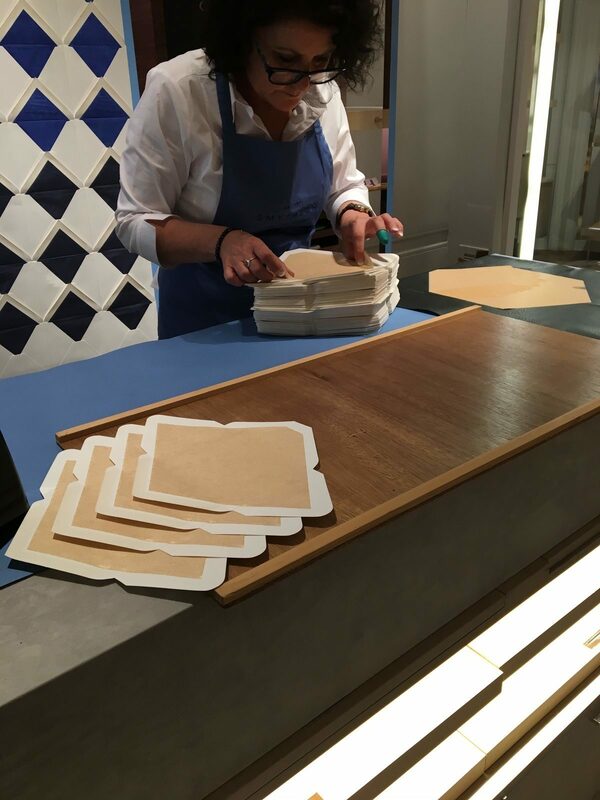 They had a series of craftspeople set up in store to show some of the process that their items go through. At the front of the store, Meg was positioned, drafting and embroidering the Smythson’s ‘S’ into a bespoke badge. 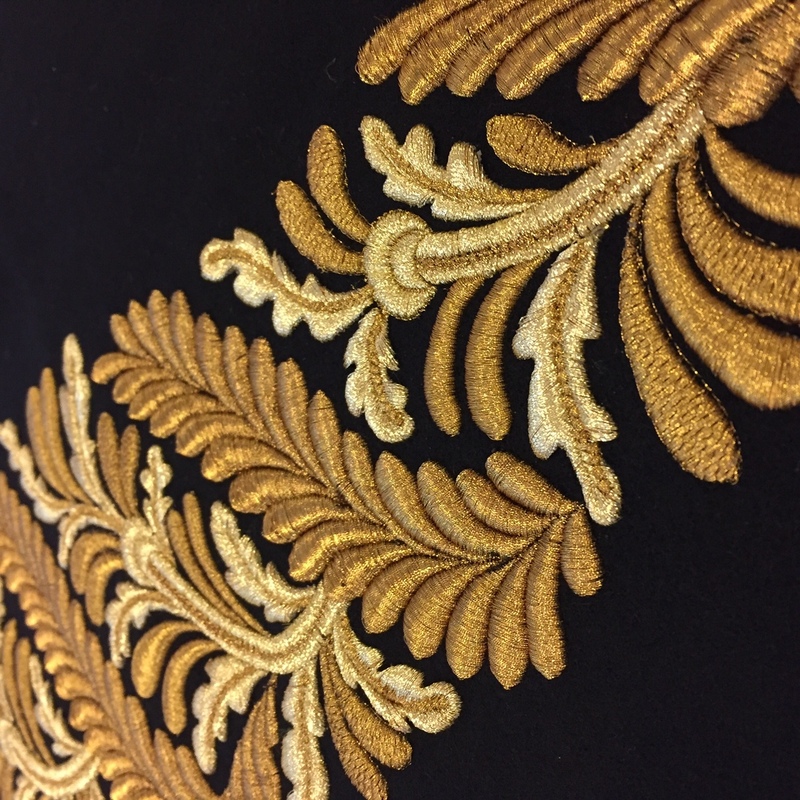 This piece will have been drafted, raised, appliqued and embroidered with cutwork bullion. On another counter, one of their book binders was stationed, explianing the properties of the binding process that thie products go through, the importance of using 2 types of glue for each piece and why they have maintained their hand processes over using machines. Finally they had another lady applying the tissue linings into their envelopes which also all done by hand. They also had a lady doing freehand calligraphy, where you could write down your name for her and she would draw it out on a card for you to take home. There were so many great ways to get involved with Craft Week this year, we cant wait to see what they will have on next year as it gets bigger and bigger each year! Hawthorne & Heaney have a new home! 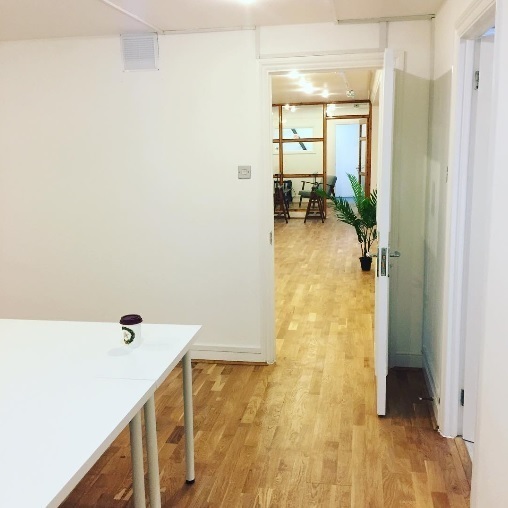 For those that don’t know Hawthorne & Heaney have moved into a fabulous new studio located in 14 Rathbone Place, Fitzrovia. 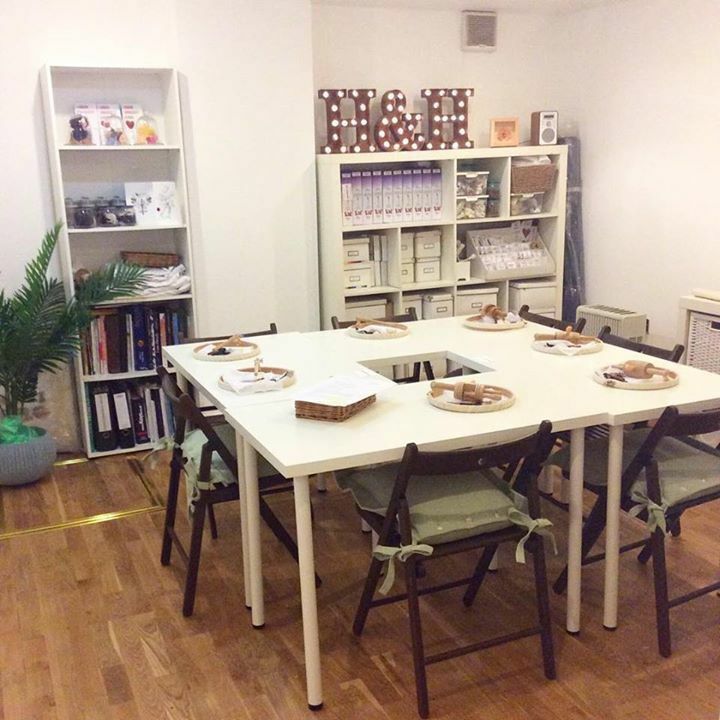 A short walk from Tottenham Court Road station the new studio is spacious, airy and bright with 3 studio spaces. 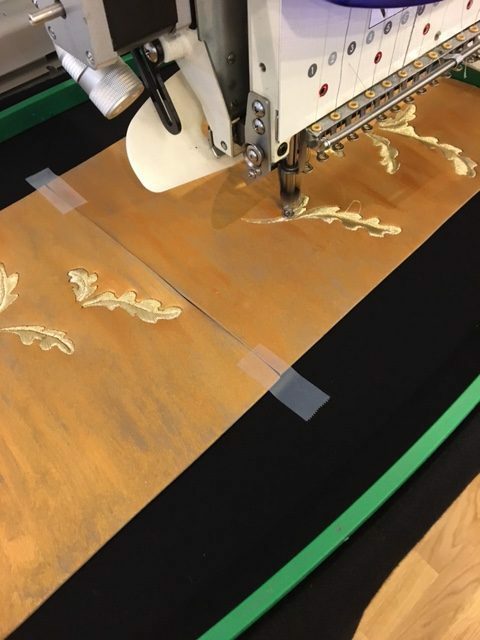 With such ample space we are able to be uber creative and this week our embroiderer Natasha has been working on creating goldwork inspired embroidery with a variation of metallic threads. Throughout history Fitzrovia has been home to many inspiration creatives such as the English writer Virginia Woolf and Nobel Prize Winner George Bernard Shaw, whose famous playwright ‘Pygmalion’ was later adapted into an American musical called ‘My Fair Lady’ 1964. Fitzrovia is also famous for the local ‘Fitzroy Tavern’ located in Charlotte Street. In the 1920’s it became the hub for artists, tradesmen and intellectuals. The latest big project in Fitzrovia has been the Great Portland Estates redevelopment of the former Royal Mail site between Rathbone Place and Newman Street. The site comprises 2.3 acres of land which will be created into a new public square with high quality offices, retail spaces and 162 residential apartments. Facebooks new UK headquarters will be located here. It seems that we are in the perfect location for our craft! For anyone interested by embroidery, Opus Anglicanum at the V&A museum is a must see exhibition. Despite its somewhat inaccessible name, the exhibition is a rare treat to see historical pieces, some of which are almost 1000 years old or on loan from usually closed archives. The Toledo Cope, 1320-30, England. The exhibition itself has a very considered, calm feel which seems to suit to nature of the materials on show. 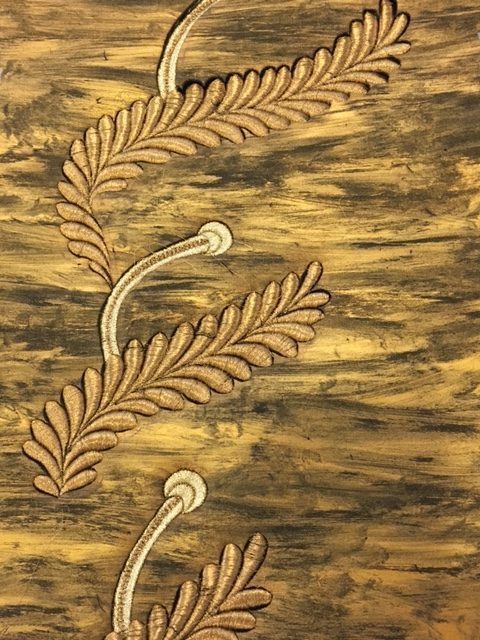 It is amazing that these pieces have survived this long, understandably some of the silks have lost the vibrancy of their colour and the metal work has tarnished, but the skill and detail are very evident. In most of the designs, the red colours have survived the best, but in the Toledo Cope the blues are especially pleasing. The descriptions of the pieces are very detailed, each siteing the types of stitch and techniques used as well as the materials in each piece. There is no doubt of the detail of these pieces is astonishing, even if our modern interpretation of the subject matters can be a little amusing like these very long lions. There are some handy videos that will fill in the gaps in anyone’s knowledge who is not familar with the techniques on display. 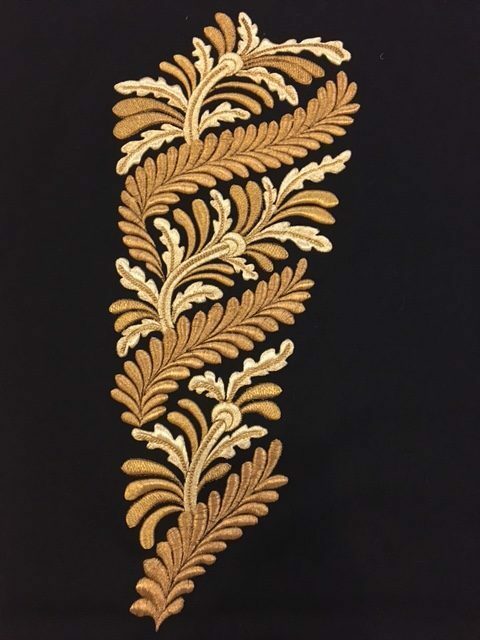 Along side the embroidery, there are a few related treat pieces such as this beautiful swan pin which shares influences with the embroidery subjects. Opus Anglicanum is open to the public at the Victoria and Albert museum now until the 5th Feb 2017. Here at Hawthorne & Heaney, we get a wide variety of projects to work on. One of the great things about working in such a creative industry is to see where people get their inspiration from and in turn having your own knowledge expanded. 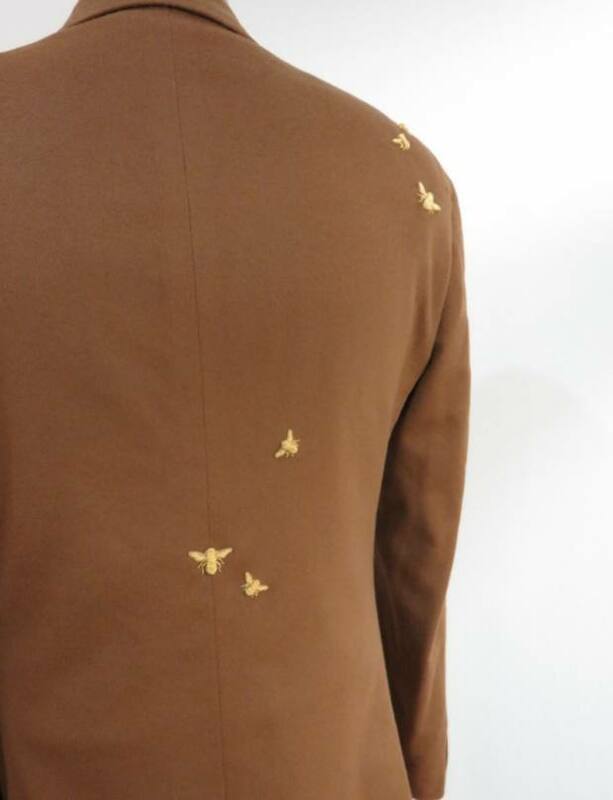 One such project is a collar piece which we worked on for a suit by a city tailor, where the inspiration was drawn from a little know archeological site called Mohenjo-daro or ‘Mound of the dead men’. The symbols were taken from pieces that were discovered at the site which is in Pakistan from what is thought to be a stamp or seal. Located in the Indus Valley, the original name of the city is unknown but they are know to supposedly had the world’s first known toilets, along other developments in civilisation such as complex stone weights, elaborately drilled gemstone necklaces and exquisitely carved seal stones featuring one of the world’s stubbornly undeciphered scripts. It is this Indus script upon which we based the design which was then excicuted in antique styled goldwork techniques. The height of the raisings of the embroidery and the blue highlights really bring this piece to life, from the unicorn to the mask.